I found a web site with deer sounds ( http://www.soundboard.com/sb/Deer_Sounds_audio.aspx ). I found playing the last one, http://www.soundboard.com/mediafiles/NTU5NzUzNTU1NTk3NzY_qriQSUR8Twg.mp3 particularly cool when it is played simultaneously with a recording of Shika no Tone. Way cool... such raw grace and beauty, naturally echoed in the various calls of deer. That's what we are doing with bamboo flutes, right? That's cool! I remember one time a great sankyoku ensemble came to SOAS, University of London. 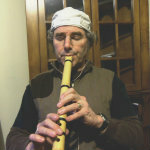 The shakuhachi player then did a solo version of shika no tone. He insisted deeds were silent so it was just a human imagination that they made sounds. I insisted back that I have heard deers in the forest being incredibly loud. I wish I had his email address so I could sent him this link!